It's February, and our thoughts all go to Valentines Day, hearts, and love, love, love. Are you singing the Beatle's song? I know that I am! But then I grew up with long hair, skinny suits, mini-dresses, dangly earrings, tie dye, rainbow colors, graffiti, and hoping and praying for love and peace everywhere! Oh, wait...those are all still here... and yet back "in" again! They might have a new name or a slightly new look, but it's all part of how patterns all repeat in our lives. All we need is love..and somehow, that never, ever, changes. So, I'm hoping and praying for peace and love...here, there, and everywhere. Peace for the Super Bowl, Peace for the Winter Olympics, Peace for our homes and in our hearts! 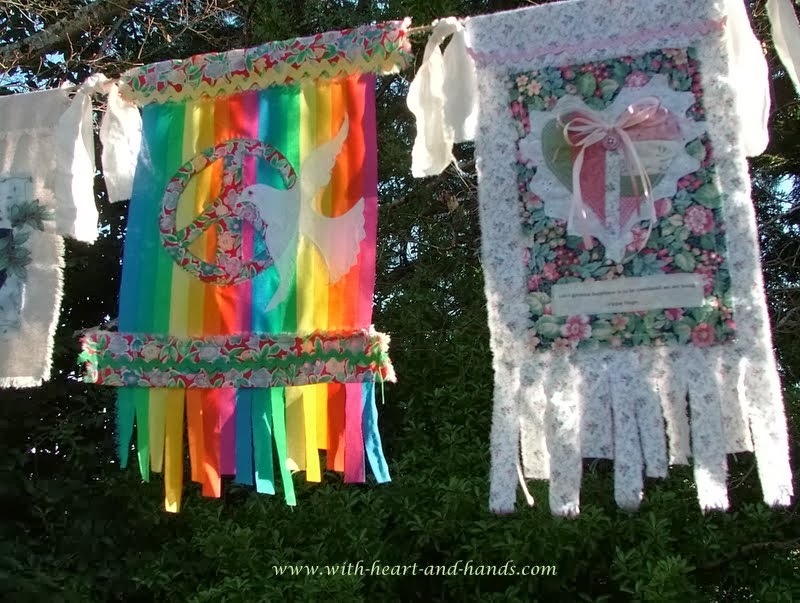 And what have I been doing?......making peace and prayer flags...it's all about love! You can always get a clue that I am really, really busy from my 'filler posts'...Quilts in Bloom at local quilt shows, updated sewing and quilting free pattern lists etc.etc.etc. But what it really means, is that I've started another new big (for me, and I'm the lady who's always busy, and never sleeps!) project. 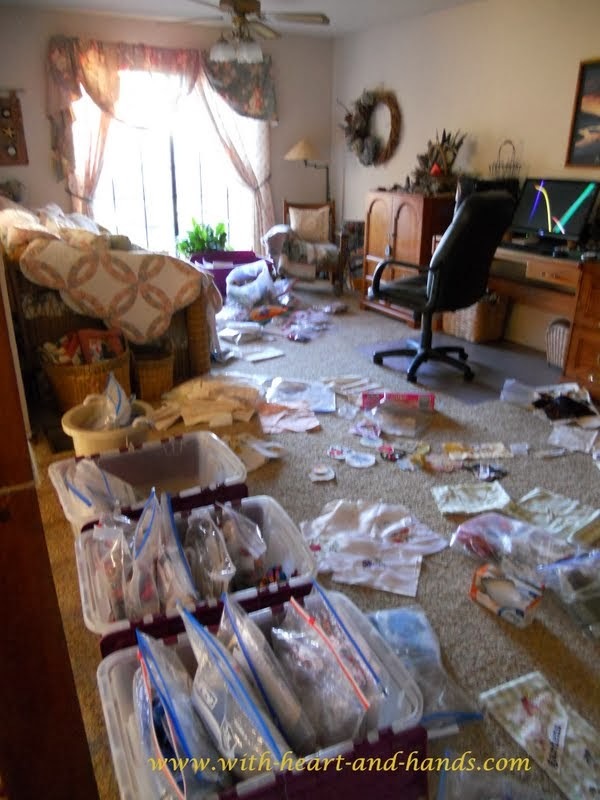 And I have filled up my sewing loft, my little sewing machine nook, and just about every surface around the computer table that I can, with the kit making ingredients of a class I will be teaching in April (at the Polk County Fairgrounds) with my own local quilters of the Mid-Valley Quilt Guild. 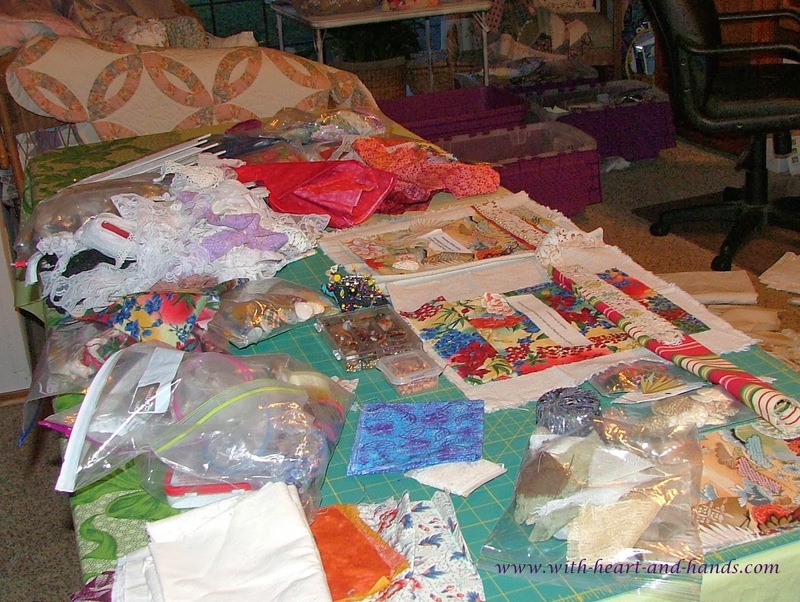 I'm starting my 3rd week making 14 prayer flag samples and lots and lots of kits for each of them and always I wonder..."why did I offer to do something more, once again?" I make a huge, huge mess beginning at 8 a.m. and clean it all up again at 5 p.m. It's actually far worse than this photo, but when I'm really busy...I can't find my camera! I can't remember where I put anything if I don't put it back where it is supposed to be! And oh, I am so tired of saying..."I know it's here, somewhere!" Somewhere keeps changing its location. Or "somewhere" simply hides under a new "somewhere".... or a different "some thing"....else! And in my constant state of sleep deprived stupor, I have to be far more organizational than you would ever, ever, possibly imagine! 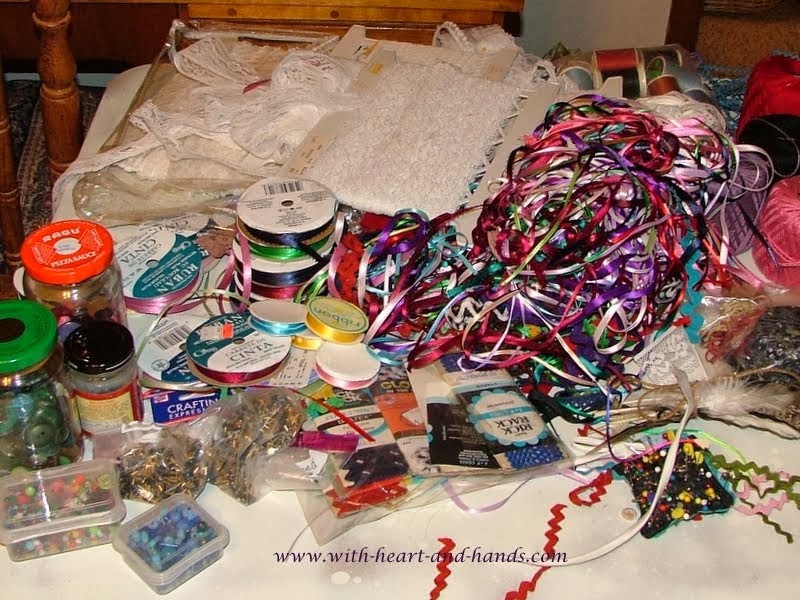 So, why do I keep repeating these patterns.... filling up my sewing loft and my heart with bright bits of fabric, ribbons, lace, buttons, beads, and thread? Because quilting and sewing lets you feel the love. You feel such happiness, such joy from the process and all I need right now..is sewing and quilting "love, love, love!" It's February and my thoughts are going to hearts, and valentines, peace, and love. So, I'm making and feeling the "Prayer Flag" love!!! And the bits and pieces are flying and so are my prayer flags ....as they get made...one by one by one! What will you be focusing on this month? Are you feeling the love yet? Michele Bilyeu shared a link. Lovely Flags. I will also be focusing on Prayer Flags that I started last year and have not completed. I'll post mine as my 4th Friday Challenge. Teaching a class to make Prayer Flags. What a wonderful way to introduce the concepts and further the purpose.